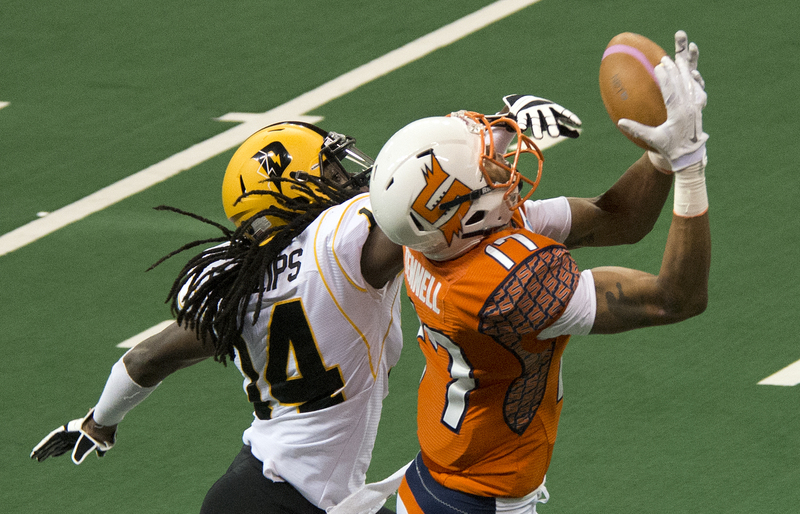 Tue., May 13, 2014, 6:28 p.m.
Sunday: Spokane Shock (5-3) at Arizona Rattlers (8-0), 3 p.m. The Spokane Shock remain in the market for a quarterback but for now they’re preparing for Sunday’s road game against unbeaten Arizona with rookie Donovan Porterie at the helm. Porterie had mixed results in his Arena Football League debut with five touchdown passes and four turnovers in a 52-41 loss to Pittsburgh last Friday. He had just three days of practice before taking his first snap. “Donovan played about the way I expected,” coach Andy Olson said. “A couple of his (three) interceptions probably could have been avoided, but those are the growing pains and learning of the game. He was a little better (Tuesday) than he was in the game. Two veteran quarterbacks changed teams Monday. L.A. acquired Aaron Garcia in a three-team deal that sent J.J. Raterink to Iowa. Teams in Spokane’s division and conference are reluctant to trade with the Shock for obvious reasons. Western teams seem to have the majority of capable quarterbacks. The asking price from opposing teams is often steep, requesting two or three starters in return. There just aren’t many quality quarterbacks available. Several AFL all-time greats retired in the last few years. Porterie tossed a 7-yard TD pass to Mike Washington on his first attempt. Porterie finished 17 of 37. The Shock were 3 of 8 on third downs and 1 of 3 on fourth downs. Standout receiver Adron Tennell was sporting a walking boot on his injured left foot. He has an appointment today to determine a course of treatment, but it appears he’ll be sidelined for a while. Tennell has 48 receptions, sharing team-high honors with Brandon Thompkins, and a team-leading 12 touchdowns. Rashaad Carter will probably replace Tennell in the starting lineup. Carter also took some reps at quarterback late in Tuesday’s practice. He stepped in at quarterback when starter Erik Meyer was hurt against L.A.
Spokane placed reserve quarterback Dennis Havrilla on recallable reassignment. He was signed last week and didn’t play in Friday’s game. … The Shock activated defensive back Antareis Bryan, who was with the team last year but didn’t appear in any games, from other league exempt. … Defensive back Paul Stephens sat out practice. He’s expected to join the CFL’s B.C. Lions in the near future. Former Shock general manager Ryan Rigmaiden is director of U.S. scouting for the Lions. Published: May 13, 2014, 6:28 p.m.